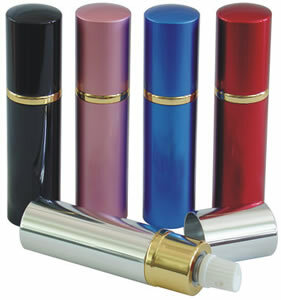 This lipstick pepper spray is a self defense product cleverly disguised in a regular looking lipstick case. It gives you the upper hand in a dangerous situation. Ladies, don't ever feel afraid or not in control again. If he decides to make you feel uncomfortable or afraid, calmly reach into your purse or pocket, pull out what looks like your lipstick, remove the top and give him a blast of pepper spray right in the face. Keeping yourself safe is everyone's top priority. Give your safety an extra layer of protection with the Lipstick Pepper Spray. A surprise weapon that can keep you from getting hurt or worse.